An Oundle community first responder has been commended for his prompt actions that saved the life of a heart attack sufferer. When Anne Lowry and her husband Robert were preparing to go to a friend’s funeral last year all appeared well. However, she suddenly felt tightness in her chest and started to lose breath. Fearing a heart attack, her husband rang 999 and requested an ambulance. Fortunately, just down the road, Oundle Community First Responder (CFR), Paul Brackley was notified of Ann’s suspected heart attack. Within minutes of 999 being called, Mr Brackley was on hand to provide vital assistance. Anne said: ‘He did some observations and was so professional, making me feel instantly calm which also helped with my breathing’. When Ann reached the hospital it was confirmed that she had indeed suffered a heart attack, and was very lucky that she avoided going into full cardiac arrest. Paul, 49 is a prominent figure in the Oundle community. As well as being the scheme’s coordinator he is also head porter at Oundle School. The scheme, which has been running for 11 years, is made up of nine volunteers who are trained in basic first aid and life support, how to use a defibrillator and also how to use salbutamol to treat asthma and breathing problems. Paul, part of the scheme from the start, explained his motivation to volunteer: ‘I feel that learning first aid and CPR is important, as you never know when it may be required. Also, having lived and worked in Oundle, I realised that an ambulance isn’t on the doorstep’. With five potential calls per shift, the scheme provides much needed support and assistance to people in the community. East Midlands Ambulance Service recently gave the scheme an ambulance-branded vehicle which will enable more people to be helped. 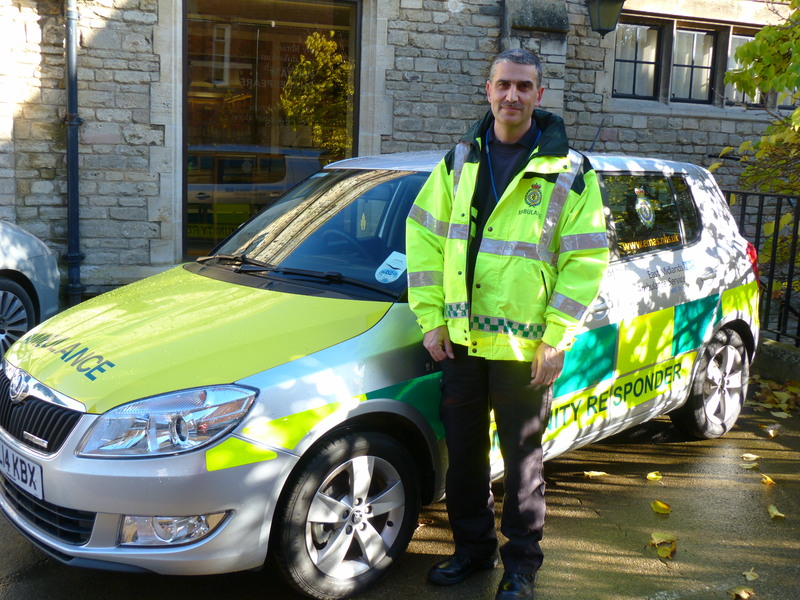 As well as being equipped with a medical kit, the cars are fitted with the latest communication system such as a two way radio, telephone, hands-free kit and satellite navigation system.